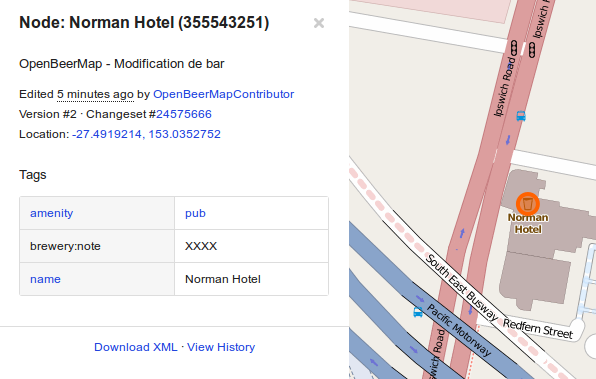 OpenBeerMap: what beers are offered nearby? | goFLOSS! OpenBeerMap: what beers are offered nearby? I am a big fan of OpenStreetMap (OSM), the collaborative map of the world, in particular because of what people can create from all the information contained in that open database. One really nice one is the OpenBeerMap project. It focuses on where a beer can be found close to you, but also what kind of beers are served (if the information was added to the database). OpenBeerMap’s website. Find the closest Karmeliet. Quick. Noémie (nlehuby on Github) has created a nifty website that uses that data with a nice minimalist Stamen background, integrated with Leaflet. You can share your location in your browser and find the closest bars/pubs/cafés, and if they are tagged with the “brewery” key in the OSM database, it will tell you which brands of beer they offer. You can find the sources of the website (and fork it) on its Github page, and a detailed account of the developing process on Noémie’s blog (in French). This website is a more modern version of Open Brewpub Map, or rather complements it as it shows slightly different information: it only reveals the places that have been tagged with the “microbrewery” key, i.e. the places that produce their own craft beer. I think that the website becomes even more useful on a smartphone. Here is the (very) easy guide to OpenBeerMap on Android. 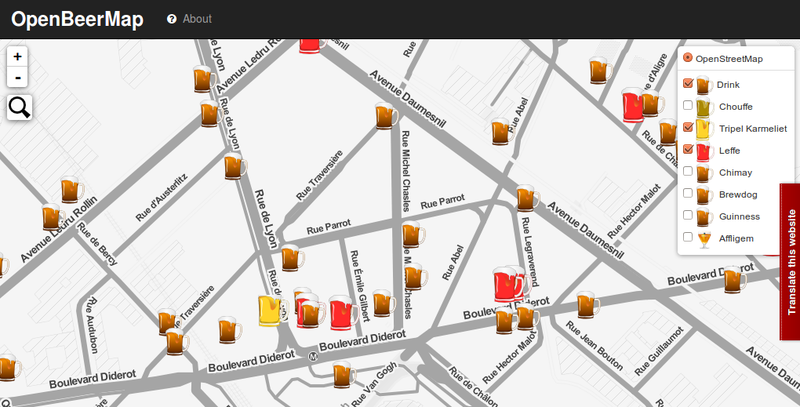 There is no dedicated app for it yet, so head to openbeermap.github.io from your stock browser. There, you can browse the map and see information about the surrounding bars. One great thing is that you can add information about the particular bar you are sipping a beer at, straight from the website. Just click the “add information about this bar” and you can update what beers that are available, add a new brand if it is not listed already, confirm WiFi availability and fill in the opening hours and even the happy hours to help your fellow cerevisaphiles! (Although for the moment the two hour fields are greyed out because, according to Noémie – and I can confirm that! –, the formatting for the OSM tags related to time are a bit tricky to get right.) Note that your edits will be credited to the user account OpenBeerMapContributor, and not yours. If you want your contribution to be credited to you, you can always use the link “éditer directement dans OpenStreetMap”. To make it easier to access it on your phone, bookmark the website and select “Add to home screen” in order to create a launcher (see pictures below). It will even have a nice maß icon. Another way to do it is to use Firefox to visit the Firefox Marketplace and get the OpenBeerMap app, for a more native experience (launcher, updates and uninstalling all work). And if you are on Firefox OS, go straight to the Marketplace to find it! One known issue with the website is that it will only show nodes, and not the polygons that have the right tags. Another problem is that, as the website looks for places tagges as pubs, bars and café, even the ones not tagged with the “brewery” key, the beer glass icon does not necessarily mean that you will find beer there: you might just be able to have a cup of tea instead. Now, hopefully this new website will attract more information to the database. At the time of writing, only 1883 objects are tagged with the “brewery” key. Contributing to the database will make it more useful for everyone. And give you a good excuse to drink more beers. Edit: This article was edited on the 11th of August 2014 to integrate the comment I got from Matthias Ämmm on Diaspora (about Open Brewpub Map) and the comments from Noémie herself (about the actual map background and the Firefox integration). Thanks guys!